The Alcohol Effects Transparency allows educators to use an overhead projector to explain the harmful effects of alcohol consumption. The transparency sheet is a great addition to a drug awareness and prevention course. 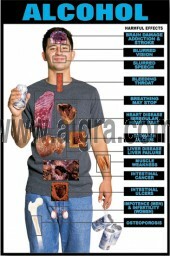 Overhead color transparency showing the Harmful Effects of Alcohol.